Rumors is one of the best albums of all time, in any genre. From start to finish, each song is astoundingly great and there is no point when you listen you feel disappointed or even disinterested. Its a greatest hits album that was just an ordinary release. The story of the band at the time is very tough to hear about; two of the couples were breaking up and the last guy found out his wife was sleeping around on him with his best friend. It comes out in the songs, and in the music, but this song is just something special. 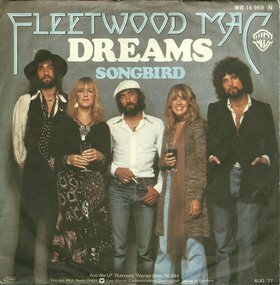 Written and played by Christine McVie, it was recorded in a concert hall in one take. The producer set up a stage for her with three spotlights on a grand piano with champagne and a dozen red roses on the top. When Fleetwood Mac would tour, that's how she would play the song and grown men in the audience would cry. Eventually McVie herself said she didn't want to play it any more because she was tired of crying. If you've never had the privilege of having a woman sing this to you* guys, you've missed a lot. Its such a simple, moving song of endearing, direct love that it reaches a place where we have no defenses. Its been covered by a lot of different artists, from the TV show Glee to Willie Nelson, but nobody has ever done it better than Christine and her piano. *Turned out she was lying about every word, but at the time it was special. Absolutely correct. With Landslide the best song ever done by this singer. Check that. By the group. McVie here. Stevie there.